Recently the students in our A2 class interviewed their English teacher. They had been studying language about jobs, so they asked their teacher Jo about her job, to find out about her English teaching career, and then took part in a role play to interview for a new English teacher at Select. The class chose Adnan as the best teacher for the job, because he was well-qualified and experienced. They decided that Joyce was the best interviewer because he asked how the English teachers would help students to improve. How long have you been an English teacher? How long have you been teaching at Select? I have been working here for 2 ½ years. Have you worked for other schools in the past? I went to Sheffield University and I have a degree in Russian Studies. I have a DELTA, which is a diploma in English language teaching. To get this qualification you need to pass an exam, write essays and be observed teaching a number of times. It is the best English teaching qualification and most teachers at Select are DELTA qualified, which is important in a good language school. I enjoy studying and learning more about my job. I have certificates in Teaching English to Young Learners and Language Awareness. I am currently studying for a diploma in English language teaching management. 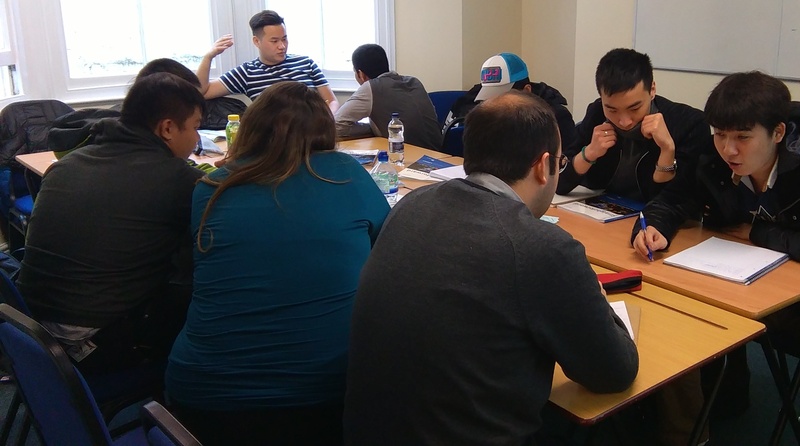 At Select all English teachers have weekly training workshops as part of our teacher development programme. Every week a different teacher/ manager runs the workshop and we learn a lot from each other. This means our teachers go to lessons with lots of good ideas to make our classes interesting, useful and fun. Do you like your job and do you like your students? I love my job and my colleagues and I really enjoy meeting and working with students from all over the world. However, it’s always sad when we have to say goodbye. Do you want to continue your teaching journey? Click here to meet more of our teachers!